It’s exactly a year since I first made my acquaintance with this most famous of Buchan ports. 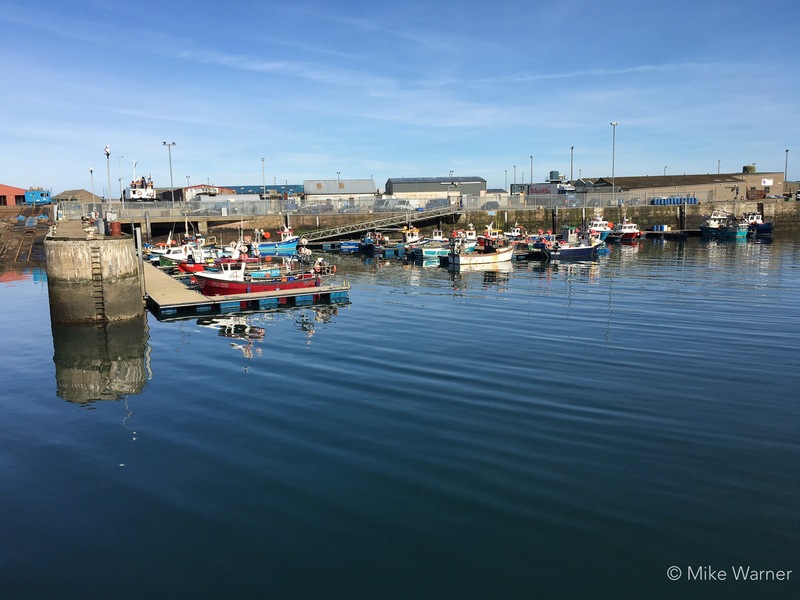 In that one, defining visit, I came to realise that as I toured the quays, vessels and market floor of this iconic and alluring fishing harbour, I’d sensed for the first time, a real purpose in my writing. Constantly inspired and enthused by the efforts and privations of those who bring fish to our table, I discovered over the course of my time spent in the company of those who work under the ever-present threat of danger, in the most strenuous and unpredictable of working environments and amidst the most rigorously administered and restrictive policy, that I needed to tell their story. Now I find myself here again. My Northerly-wending train, conveying me back to Aberdeen, 12 months hence and from there onto Peterhead, to reaquaint myself with men I feel I now know well and whose exploits I have followed this last year, as they strive to land cod, haddock, saithe, hake and prawns from the sombre and unforgiving waters of the North Atlantic and North Sea, under the supposed auspices of the Common Fisheries Policy. Things have rapidly moved on in the world of these pioneering and inventive commercial fisherman. The welcome and much heralded news last year of improved white fish stocks and encouraging levels of investment in both new vessels and port infrastructure, the focus of my research a year ago, has undoubtedly now been tempered with the introduction of the Landing Obligation (LO), or more colloquially, the “Discards Ban” which in its hurriedly conceived current form, seeks to transfer the discarded proportion of juvenile and non-quota species landed, from the naturally sustaining and recycling environment of the seas, to landfill and uses beyond that of human consumption, depriving not only the marine environment of a resource, but the skippers and crews of opportunity. With my interest in this subject heightened now, I feel intrigued to learn more, not just as an ardent lover and enthusiastic consumer of seafood, but as someone who might be able to contribute to the knowledge of those less able to engage with the industry as me. I’ve learnt a lot, that’s not in doubt, since Jimmy Buchan ushered me onto the deck of Amity II last March, but now I need to enrich that knowledge with detail and come to a fuller understanding of what fishing under the current regime and its accompanying legislative raft really means and how their systems are managed to avoid costly infringement and at the same time maximising efficiency. 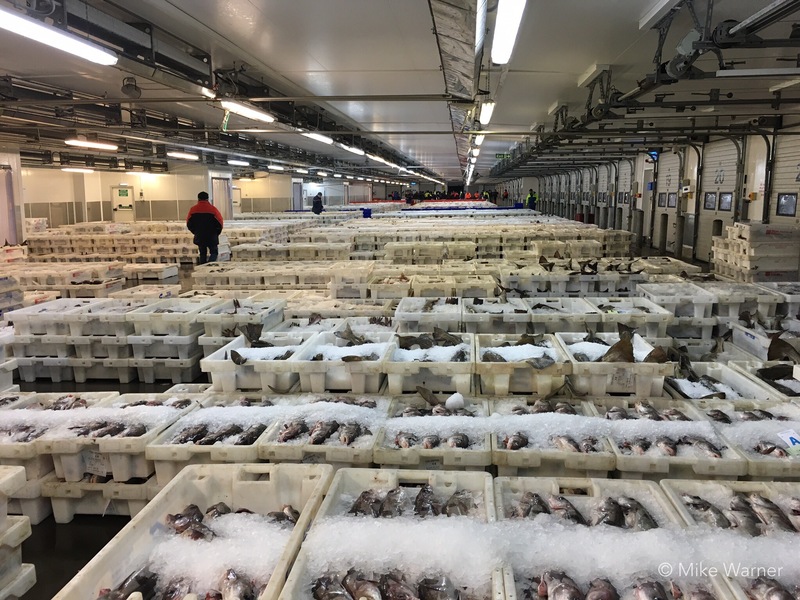 My first stop on arrival at the port is naturally the fish market, primarily to satisfy my need to gaze upon some of the finest white fish that our UK waters yield. I’m not disappointed either, as on entering the building having donned boots and market coat, I’m met by an incredible array of nearly 7000 boxes of all the main species. 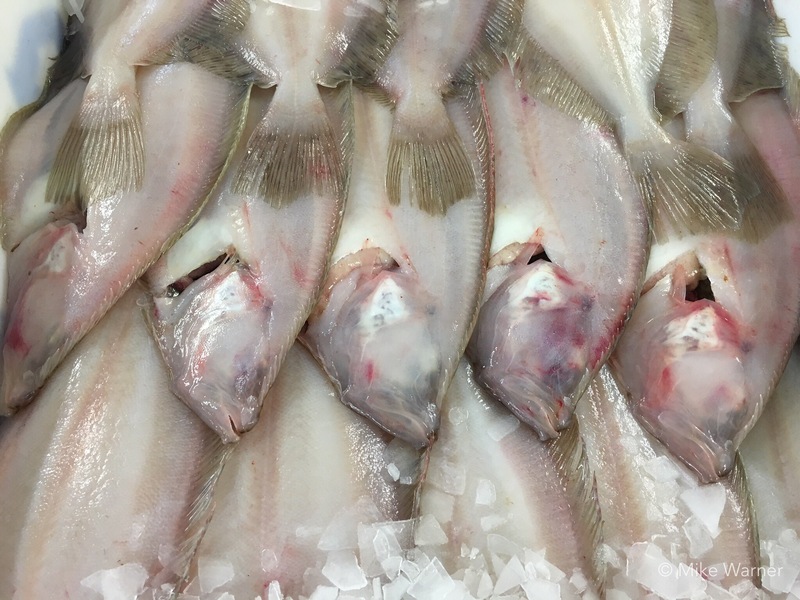 Haddock, the local mainstay, monster cod, abundant black or saithe and a multitude of monks and megrims all beautifully ordered and awaiting the auction shouts. I spy retired skipper Sandy Watt from the Port Authority, who greets me warmly and is keen to fill me in on the mornings proceedings. Merchants stop to chat, and I snap away recording images that will serve to remind me and intrigue others as to the variety and provenance of the fish landed here. Through the calls and bellows of the auctioneers, I enquire as to the number of “discards” on the market that morning and learn that out of the considerable combined haul, only a few hundred kilos of juvenile and non-quota species (the merest fraction of the total) are consigned to the yellow bins of the discards area. Testament indeed to responsible and selective fishing with innovation and adaption at the forefront of current trawling and seining technology. Later I move to the Dolphin Cafe and am joined by one or two characters whom I’ve come to know well now over the last 12 months. Peter Bruce the proactive and engaging skipper of the pair seiner Budding Rose PD418 appears and we enter a fruitful discussion on haddock recruitment and maturity and I learn how the North Sea fishing might appear in the future with potential to develop the plaice fishery further South, with that particular species being more numerous on the grounds than ever before. Peter’s passion for his work is indelible. Always one to promote and publicise fishermens’ achievements, he is an effective and knowledgable orator for the industry. Another recent and notable initiative among the Scottish fleet is the Responsible Fishing Scheme. 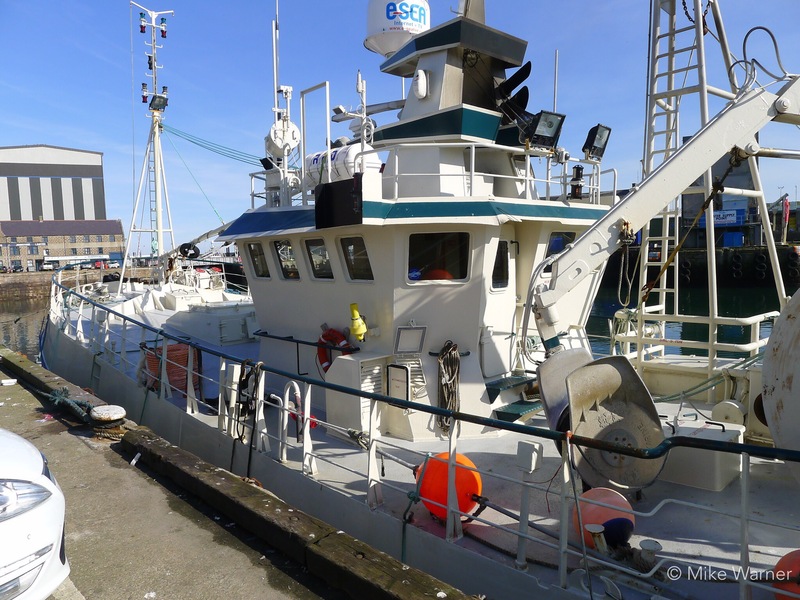 Primarily a vessel based approach, it fosters good practice throughout the working of a boat from fishing ethics and onboard Health & Safety, to crew welfare and training. 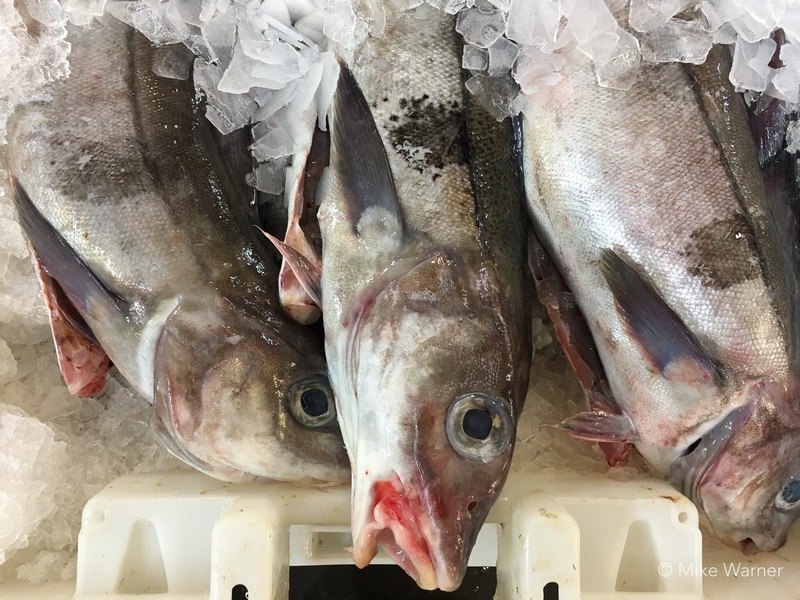 Endorsed by the Scottish White Fish Producers Association (SWFPA) it currently boasts 50 member vessels with the target of 160 hopefully registered by the summer. Peter’s vessel has been signed up to RFS for a while and although happy to support the scheme and reap the benefits of compliance, he’s also at pains to point out that its administration aboard, can’t be at the expense of the boat’s profitability and the Skipper’s time. The morning has worn on and as Peter bids me farewell to attend to his daily business, I succumb to the hunger brought on by a riveting few hours talking fish with some of the industry’s greatest exponents. A large Peterhead haddock and chips is what it takes, to revive my senses and set me up for the remainder of the day, as I pick my way round the port, from quay to quay and vessel to vessel, stopping to chat and question any fishermen whom I encounter in the course of my tour. Several hours later, having enjoyed exploring the harbour on the sunniest of March afternoons, I make my way happily back to the hotel, having learned earlier from Jimmy Buchan, that Amity II will be landing her catch in the early hours next morning. An event timed to perfection with my visit and one that fills me with huge anticipation and excitement. So, at a keenly felt 3am, on a crisp Peterhead morning the next day, my phone chirps into life beside my bed at Buchan Braes hotel. 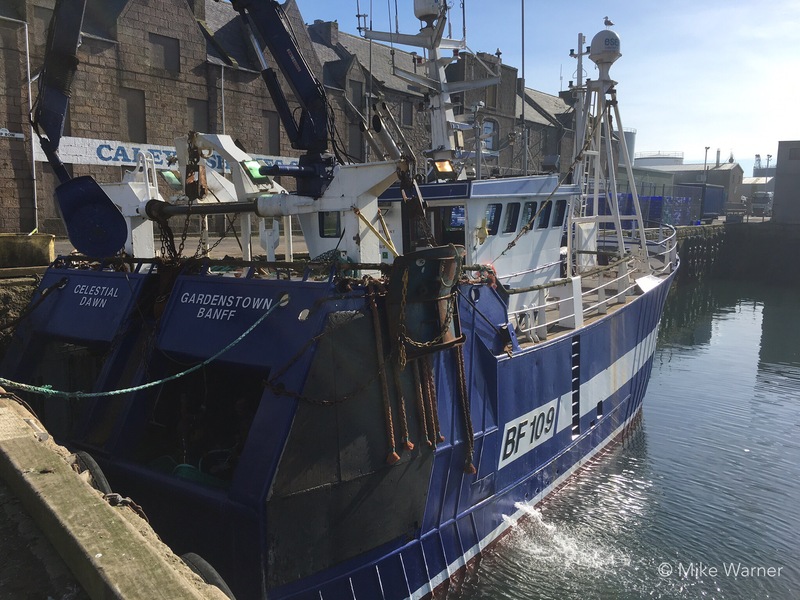 Answering immediately, I recognise the thick Broch tones of Philip Reid, Jimmy’s young, but massively experienced and competent Skipper, who 5 miles out in the dark of the North Sea, is heading homeward with a mixed catch of langoustine and white fish for landing at the mornings market. Thirty-something minutes later and I’m on Peterhead’s Fish Quay, as Amity II ties up alongside. The glare of her work lamps pick out the wheeling Herring Gulls and Blackbacks, vociferously jostling for position atop the vessel’s superstructure, as a group of hungry, harbour inhabitants in the form of three Grey seals, cruise ghost-like and expectantly alongside. 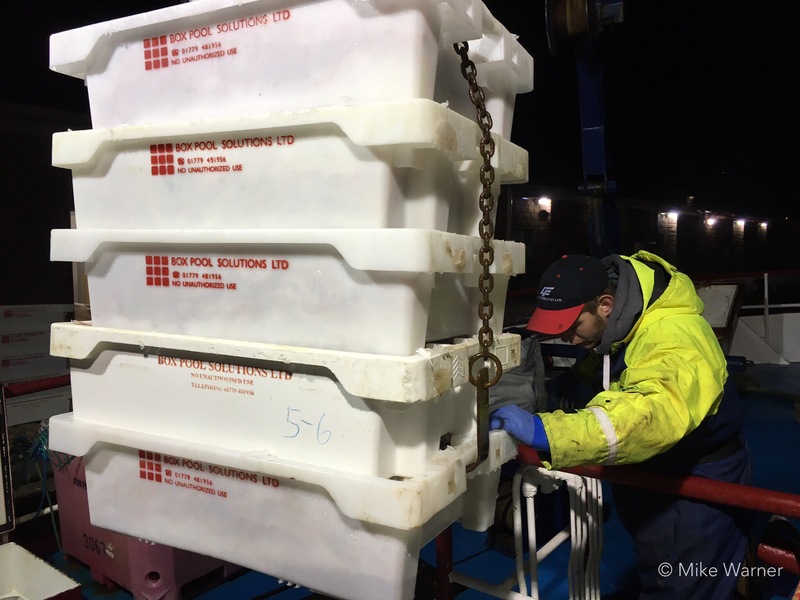 First up from the hold, the 50 boxes of mixed white fish -cod, whiting, witches, squid, plaice and megrims all iced and boxed, swinging quaywards from the derrick. Next follows the prize of the trip and 160 boxes of Jimmy’s famous langoustines, graded for size and still very much alive, some having tumbled from the cod end only hours earlier. Philip expertly mans the derrick’s hydraulics swinging the boxes to awaiting pallets, from deep down in Amity’s fish-room. He’s an excited man. 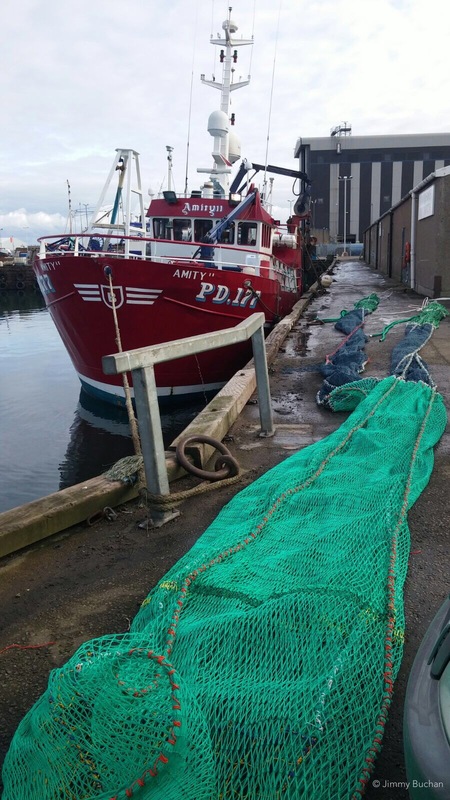 This 8 day trip on the langoustine grounds has seen the trialling of a new net, via a derogation organised by the Scottish Fishermens Federation (SFF). It’s a groundbreaking design built upon the experiences of many years adaption and innovation in trying to reduce the volume of bycatch (juvenile or non-quota species). Now incentivised further, under the requirements of the LO, Jimmy and gear technologist, Mike Montgomerie of Seafish, have struck on a design that might just tick every box in a time and energy saving trawl of ultimate selectivity. The principle is simple. A standard “scraper trawl” is modified to include a square box compartment that features an inclined separator panel. Fish and prawns swimming together hit the mesh of the panel, the dimensions of which allow the prawns to drop through and the fish to swim on and above into two separate cod ends or ” bags” ensuring segregation and much improved quality on both counts. “This gives us less downtime in sorting and grading” Philip tells me. ” You’re achieving maximum separation within the trawl. It also means less damage for both fish and prawns and reflected hopefully in better prices on the market. Also it’s easier for us to work with. Less downtime for the crew and an easier net to mend should damage occur.” Being a twin rig vessel and towing two nets, of course also allows the crew easy comparisons to be made, between the control (conventional) gear and the new design. 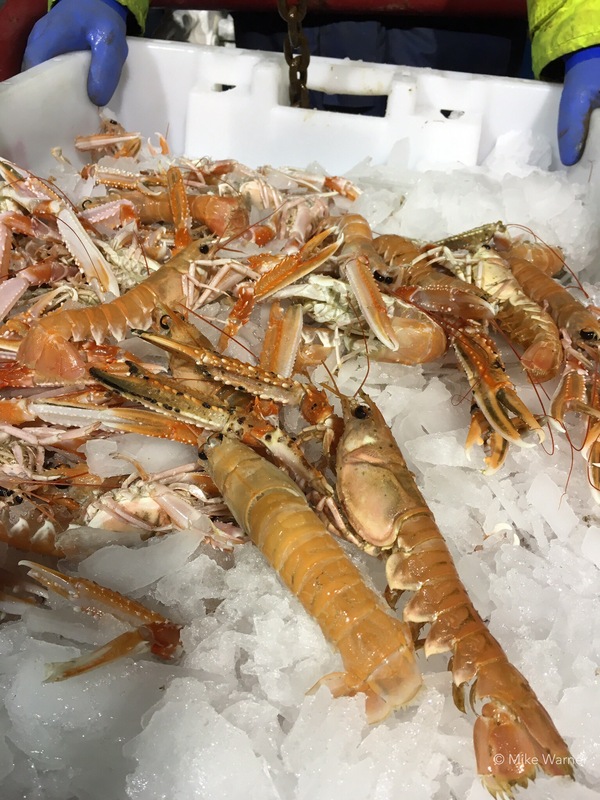 As the 160 boxes of langoustines disappear into the doors of the market. I find myself in the wheelhouse and learn even more detail from ex-Skipper Alexander McClean, who as an observer for SFF, has been monitoring the trial at sea. A natural sceptic, even he has been astonished by the results and as we steam slowly back through the slowly brightening harbour, I’m told just how important a breakthrough this will be if Jimmy and Amity are allowed to take the trial further. During a recent visit to Hirtshals in Denmark to observe various types of trawl gear demonstrated in the Flume Tank there, I was shown in detail with scale models, the exact function and style of the modern gear used by boats around the country. A course for non-fishers run by Seafish, it afforded us the chance to learn the nuances involved when targeting different species and the management required aboard in getting gear to fish correctly and efficiently. 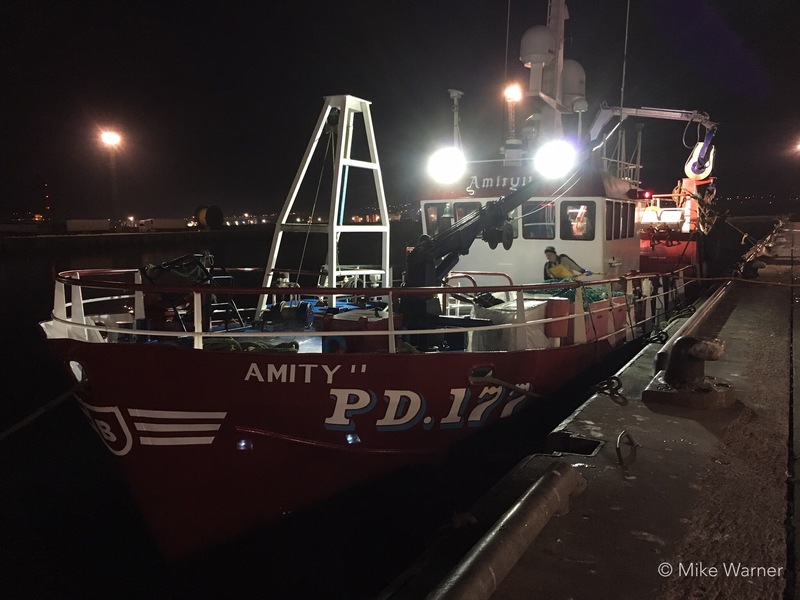 Now back aboard Amity and equipped with a far better understanding of what skippers and crews are trying to achieve I realise that the science of fishing practice is more than often than not, conceived and adopted in the wheelhouse. The mindset of fishermen forced to improve their systems under the threat of penalisation, has changed markedly, significantly so in recent years, and notably with the introduction of CCTV cameras and real-time data collection. The boxers of Amity’s pristine prawns, undamaged and set to command the best prices through optimum, quality selection and respectful handling are testament to the ingenuity that now is commonplace in our fishing ports. Whether we remain in or exit the EU, as far as the fishing industry is concerned, one thing is clear. 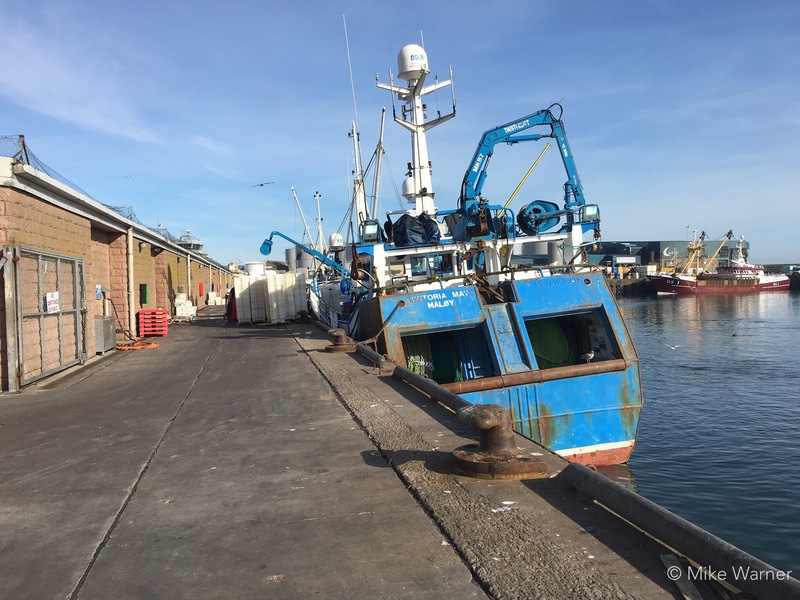 Improvements in efficiency, good practice, crew welfare and innovation mean our fishermen are well placed and ready for a productive and eminently sustainable future. Excellent insight and very fine photos. Thank you!